Long-term grout discoloration can cause tile floors to look dingy even after a good cleaning. With our new Hard Floor Surface Cleaning equipment, we can make your tile floors look like they’ve never been walked on. We will power-wash the floor, cleaning the tiles and whitening the grout. After 72 hours, we recommend that you can seal the tile grout to keep it clean and guard against future discoloration. Cork floors have been around for centuries, and they’re back in vogue because they’re eco-friendly and comfortable to stand on. However, they can lose their luster just like any other natural flooring materials. We have the equipment and expertise to keep your cork floor looking great. Gleaming hardwoods add a stunning and natural element to any home or business, if you make sure they receive some special care. 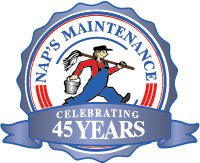 Although we don’t strip and refinish wood floors, our method at Nap’s Maintenance is perfect for maintaining your wood floor on a regular basis. We will damp-mop to keep from scratching the floor, then complete the process with a bowling alley wax for ultimate shine and protection.